and Mrs. Callegari will be happy to assist you. Are you looking for an Original Cuckoo Clock? If so, then you should not just search for any Cuckoo Clock—you should look for a Black Forest Cuckoo Clock. An „Original Cuckoo Clock“ traditionally comes from the Black Forest, from world-famous Black Forest clock factories. Very special is a Cuckoo Clock from Triberg, very close to the world’s largest Cuckoo Clock (Schonach near Triberg). High-quality handcarving on the outside of the clock are especially attractive, with many fine details. The most well-known example ist he classic Black Forest Clock. To make room for the Black Forest Cuckoo Clock in the modern homes, many interesting modern Cuckoo Clocks have been created with simple and elegant designs, even though they house the traditional Black Forest clockworks. And even on a modern Cuckoo Clock the Cuckoo bird is a must! A Black Forest Cuckoo Clock makes an ideal souvenir to take home with you. 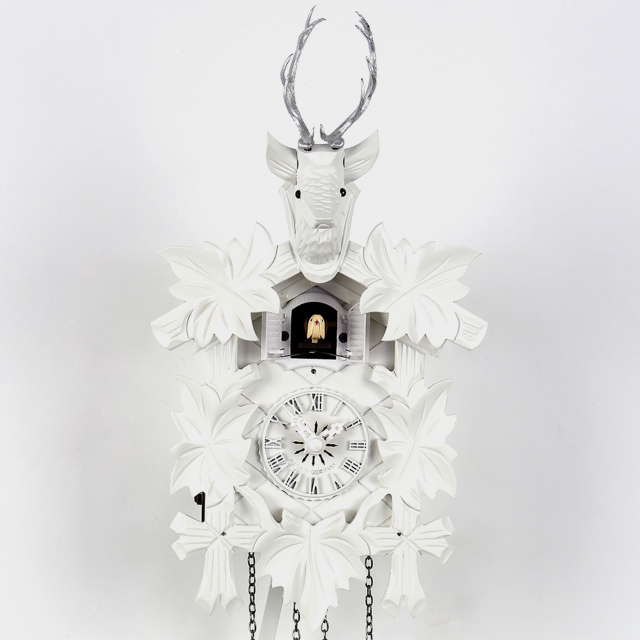 Of course, the Cuckoo Clock can also be ordered in our Online Shop. 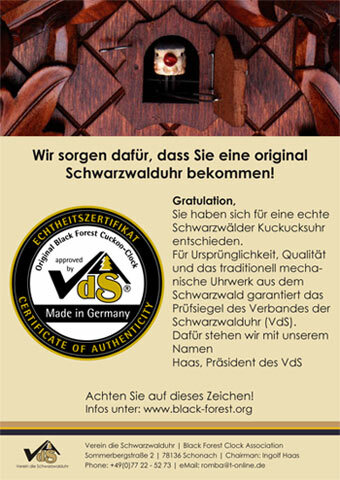 The „Black Forest Cuckoo Clock Association“ (VdS) issues a certificate of authenticity for all the mechanical clocks that have all of their components made here in the Black Forest. That way you can ensure that you have purchased a Cuckoo Clock that is really „made in Germany“, and not a cheap copy. Clocks with this certificate are well sought after due to their quality and tradition. 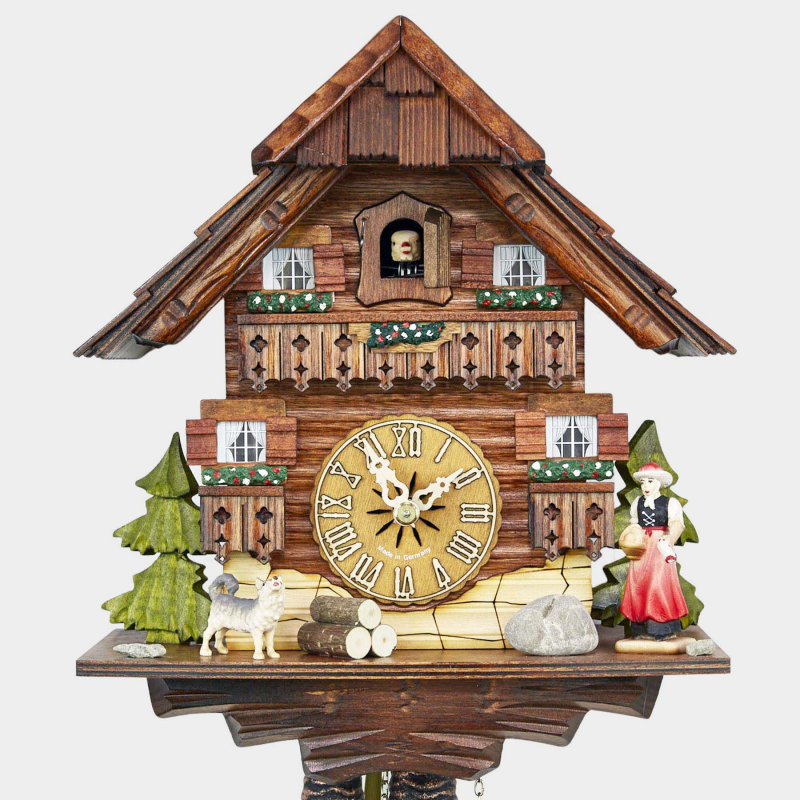 Cuckoo Clocks from the Black Forest are well-loved worldwide. Many of us as children waited expectantly in front of the beautifully carved Cuckoo Clock for the striking of the hour, staring at the clockface just to see the door of the Cuckoo Clock open and the little cuckoo bird pop its head out to call the number of the hour. This special feature of the Black Forest Clock has an appeal that never loses its flair and originality. The production of the Black Forest Cuckoo Clock began as early as the 17th century. The farmers were poor, the harvests meager, and wood as a raw material was to be found everywhere. The inventive Black Forest farmers could carve wood, and wanted to make some additional income for their families. Because the metal clockworks were so expensive, the first mechanical clock movements were made of wood. 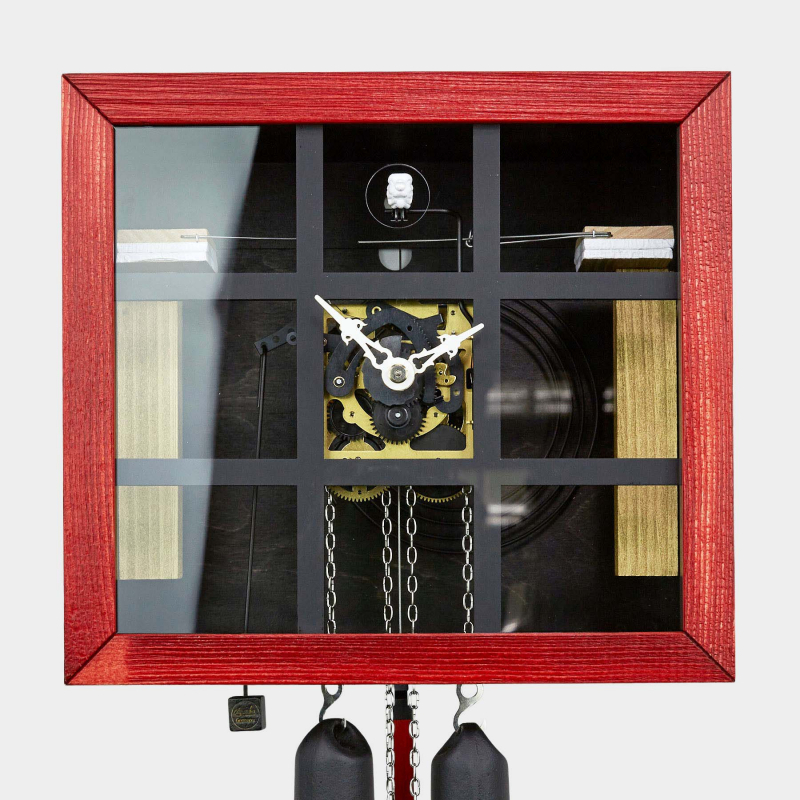 The Black Forest Clock was low in price, solidly made, and beautifully handcrafted. The special feature of the clocks, though, was the little cuckoo bird, which to this day has found a large fan club. Every full hour the little door opens, the cuckoo bird pops his head out and calls the number of the hour. The number of cuckoo calls reveals the time. At every half-hour the cuckoo comes out and calls one time. As time went by, the original Cuckoo Clock continued to be updated and developed. The wooden clock movements of the first Cuckoo Clocks were replaced with metal clockworks, and if desired, a music box could be built into the clock as well. The classic and high-quality handcrafting—the traditional Black Forest Clock—remained. There is a large selection of beautifully handcarved clock faces in a large variety of designs. When you buy a Cuckoo Clock, you can select a clock according to your individual wishes and personal taste. Both the inside and the outside of the clock influence which clock is chosen. Let’s take a look at the differences in the INSIDE of the clocks—the clock movement itself. In a traditional Black Forest Cuckoo Clock, the clock has a mechanical clock movement that is wound by pulling up the chains by hand. There are both one-day wind and one-week wind clock movements. That means that you can choose whether you want a clock that must be wound every day or just once a week. The mechanical clock movements are not only different in how often they are wound—the one-week (8-day) movement is bigger than the one-day movement. This is one of the aspects of the price difference between clock models. A one-day wind mechanical clock is less expensive than an 8-day wind clock, because the 8-day clock movement is larger and more detailed in production. A less-expensive alternative to the mechanical clock movement is the Quartz Battery Cuckoo Clock movement, which runs on 1,5 V batteries. It is not easy to recognize optically whether a Black Forest Cuckoo Clock is mechanical or battery-run just by looking at the outside of clock. In order to really find out, you must take the clock from the wall and look at the insides of the clock. A Cuckoo Clock with a Quartz battery clock movement is very easy to operate and doesn’t need to be cleaned or oiled. If problems arise after several years, the clock movement can be renewed (exchanged) fairly easily. Keep in mind that when you buy an original Black Forest Cuckoo Clock, there is a two-year guarantee. What is a „Chalet“ Clock? You have probably noticed differences between the clocks when you look at the traditional Black Forest clocks. Each one is different from the next. There is a Black Forest Clock that is designed like a Black Forest house, with roof, windows, balconies, people, animals and trees. This style of Cuckoo Clock is called a „Chalet Clock“, because it models a little house. The traditional house clocks are produced with and without a music box inside. Chalet Clocks are more complicated than a normal Cuckoo Clock in their production, due to the many small moving parts on the clock. The extent of the lovingly created details vary according to the price category and the size of the clock. The roof of the „Chalet Clock“ is created by the handcrafting of single wooden shingles, which are also applied to the clock roof by hand. The people and the animals have especially expressive faces. The richly detailed components oft he Chalet Clock are not only beautiful to look at—they also have moving parts. Many technical parts are needed in order to produce the fascinating moving action which makes these clocks so special. Because of the more elaborate work needed on these Chalet Clocks, they are more highly priced than one of the simpler modern designs, for instance. But the richly detailed Black Forest Cuckoo Clock in Chalet style is a one-of-a-kind attraction that will bring you pleasure for years to come. In contrast to the modern design Cuckoo Clocks, a classicly designed Clock from the Black Forest is created from detailed handcarvings. The most well-loved design is the leafy branches, a carving made up of several beautifully carved leaves. Depending on the specific model, the clocks are additionally decorated with birds or hunting designs with many richly detailed handcarved decorations. The clocks are not only distinctive in the style of the handcarving, but also in the varying wood stains, with each clock factory producing its own special stain. Not only that, the front of the clock can be additionally colored to add special effects. Most of the classicly designed Cuckoo Clocks with carving on the front have a walnut stain, with a matching color on the clock dial. The distinction from a Chalet Clock style is that there are no moving wooden figurines like a woodchopper or beer drinker that have to be built into the clock. The handcarved Cuckoo Clocks come in different sizes and carving designs, and are always an eye-catcher. A classic mechanical Cuckoo Clock or a modern Cuckoo Clock with a Quartz battery clock movement can be very fascinating, but not in every situation. In order to ensure that your Cuckoo Clock calls the cuckoo call and plays music only when you want it to, you can buy one of the models that have an integrated Night Switch Off (manual, or automatic on the cuckoo clocks with Quartz battery clock movement). Then you won’t be bothered by the call of the Cuckoo or the music while you are sleeping. This function is especially important when you have the clock hanging in a room where you want to work in a concentrated manner and don’t want to be distracted. When purchasing a classical mechanical Cuckoo Clock with a music box, you have two alternating melodies. On a 8-day mechanical clock, the melodies alternate every hour, and on a one-day mechanical clock, every half-hour, always after the cuckoo calls. Modern Cuckoo Clocks with a quartz battery movement have 12 different melodies. Each hour another melody plays at the hour after the cuckoo calls. With so many melodies, you will be sure to find songs that you like. Just like the world’s largest Cuckoo Clock in the Black Forest (Schonach), the clockfaces of the Cuckoo Clocks are intentionally simple. The numbers on the clock dial are typically roman numerals, and the clock hands match the roman style and are made of wood, and, for the more modern designs, of metal. A classical or modern Cuckoo Clock always include a clock movement inside. You can choose between a mechanical clock movement or a quartz battery clock movement. The following clock factories build their clocks with quality clock movements that are produced here in the Black Forest: Hönes, Romba, Schneider Anton & Söhne, Hekas, Hubert Herr, Trenkle, August Schwer, Schwer Gerhard, MYBIRDY, Robert Herr, Engstler and Samuel Kammerer. The largest Cuckoo Clock is still run by a wooden clock movement, but the modern Cuckoo Clock uses a quality metal and brass movement. If you prefer an antique clock that will match your antique furnishings, then you don’t necessarily need to buy an antique clock from the Black Forest. You can also choose a Cuckoo Clock in the traditional Railroad House style that is modelled after an antique design from the 1800’s. The style is exactly the same as the original design, and the technical features and handcrafting are very authentic. All of the traditional Cuckoo Clocks from the Black Forest are handcrafted with rich details. Many modern elements have been added to the clocks, of course, to meet the wishes of many who have modern furnishings, yet want a clock with a moving cuckoo. Upon selecting a clock, take your time to decide which features are the most appealing to you personally. Get a fan on facebook and save! Become a fan of "House of 1000 clocks®"
All of the mechanical cuckoo clocks that are in our Online Shop have the VdS-authenticity certificate! 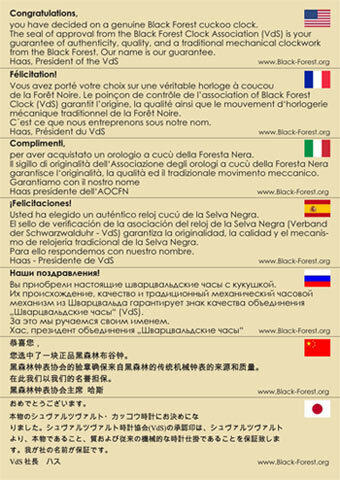 Black Forest clocks that are given this certificate must fulfill a high standard. One stipulation, for example, is that the clock is made exclusively in the Black Forest. But not only the proof-of-origin is enough to receive the certificate. The clock must be completely mechanical and all of the single pieces must be made in the Black Forest. There is no possibility to get one of these sought-after certificates for a quartz battery clock, or for a solar-powered clock. WELCOME to the House of 1000 clocks® - feel free to discover our presence.